Therefore you need to ensure that it is working at its peak efficiency if you want your company to continue to grow. 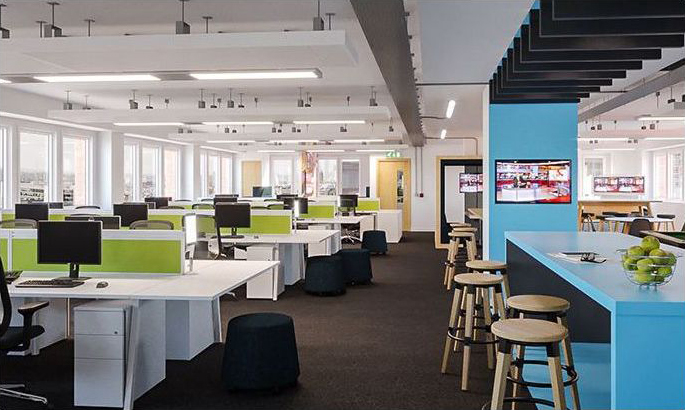 When it comes to office interior refurbishment, it is important to make certain that every aspect of your workplace design works in conjunction with the others to create an effective and dynamic workplace atmosphere. It's often beneficial to bear in mind that you shouldn't always favour a particular design, simply because it might currently be “fashionable" – your office 'look & feel' will remain long after office design trends have moved on; instead you should try where possible to ensure that your decisions on the 'perfect layout and design' includes an element of practicality. De-mountable partitioning systems are ideal for creating new environments and dividing existing space, quickly. We can provide a wide variety of styles and materials including single and double-glazed modules, solid plasterboard and composite elevations as well as full-height frameless glass versions. What are the benefits of partitioning? Various types of partitioning are available (glass, solid, laminated cubicles etc.) and you can decide according to the needs of your office. For example, glass partition walls will allow more natural light into the office and will create an open plan outline without isolating employees. They can also be taken down and relocated with the minimum of disruption. Unlike other types of solid walls, office partitions are relatively quick and inexpensive to install and are very easy to maintain. As well as the practical benefits, partitioning systems are available in any colour you want so you can easily include your company colours (branding) if you prefer. can provide a great way to quickly create privacy, whether it's for a meeting, a training session or to make a short phone call. With workplaces becoming a more crowded and pressurised environment, a carefully thought out partitioning layout can help provide and maintain a calm and relaxed atmosphere. We can provide raised access flooring that allows easy cables-management, with recessed floor boxes (serviced outlet traps) that supply power and data connections wherever needed. Barrier matting is available in various finishes and it can be fitted at entrances & exits to the building to reduce the amount of dirt and dust brought in, which can help to extend the life and appearance of your new office flooring elsewhere. In addition, warehouse and industrial floors can be treated with specialist coverings to prevent staining and aid slip-prevention. Oaktree Interiors will take care of all building and landlord applications where necessary on your behalf.